← trip to Sucre, another one for the books. sorry it´s been awhile. i´ve been jotting notes on paper mostly. since we´re traveling it´s been hard to get internet time. here´s what i wrote an hour ago. i had another LaPaz adventure today… i rode the city bus. (supposedly there are under 1 million people living in this city. i don´t believe it for a moment.) riding the city bus in a new place is monumental for me cause it means i can get around with the locals. every city transportation system is fasinating. in LaPaz there are at least three main means of motorized transport. i see VERY few privately owned vehicles. people walk and i´ve only seen one bicycle. the expensive way to travel is by taxi. usually 6-12 bolivianos. $8bs=$1usd. here you don´t tip taxis, as far as i can tell. next is the shared taxi and the shared van. and then the public bus. the shared van is the most unusual. SMALLER toyota-type minivans, flourecent lettered signs block the passenger windsheild. these vans cascade down the streets, seeming to bounce of the walls as they avoid hitting people and each other. a caller leans out the door or window shouting in rapid succession the streets its going to travel. it costs $1.5bs. it slows down for passengers to jump on or off. LaPaz is by far the worst city for driving. they drive like there is a 2¨ force field protecting them. and the vehicles are so beat up i don´t know how they survive the san francisco-like hills. 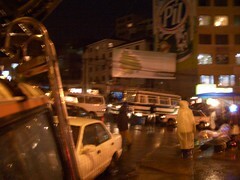 so we were traveling along when the bus was diverted with traffic off the main ave by police. found out later it was for a demonstration. i think there´s been one almost every day i´ve been here. it´s 4 in the afternoon. people are our walking with icecream, enjoying the weather. there´s a brief break in the traffic smog. i am sitting in the landscaped medium with at least 100 art students who are sketching the surroundings. i´ve been approached 3 times by young shoe shiners, eyeing my new balance sneakers. make that four. i give my icecream to the 6th.